For the first installment of our new monthly feature detailing amazing plays on the cloth, we take a close look at what is often now described as �the greatest shot in pool history�: Efren Reyes� two-rail kick shot in the case game of the 1995 Sands Regency XXI final. Ironically, the shot in question came about as a result of a rare Reyes mistake. With the score tied 12-12 in the race-to-13 final against Earl Strickland, Reyes opted for a safety on the 5 ball. He banked the 5 off the foot rail, intending to leave the cue ball behind the 6, and the 5 on the head rail. And that�s exactly what happened � except the 5 accidentally nudged the 8 ball into the head-rail left-corner pocket on its way up table. Reyes left himself the same devious safe he intended for Strickland. Reyes applied mild left topspin on the cue ball, so it would have more bounce and speed off the rails. 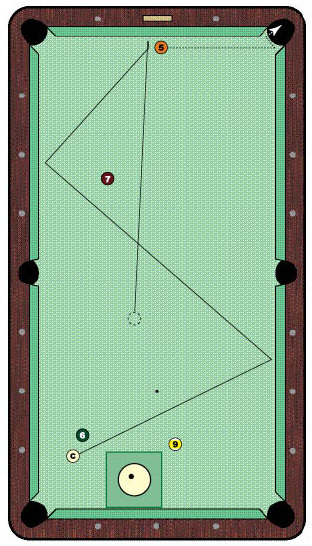 Sure enough, the shot not only knocked the 5 down the end rail and into the corner pocket, but the cue ball then strolled downtable for great shape on the 6. The crowd erupted into a spontaneous standing ovation, and even Strickland applauded from his seat. After Reyes ran to the 9 ball, Strickland rose from his chair, ceded the match and lifted Reyes� hand high in victory.